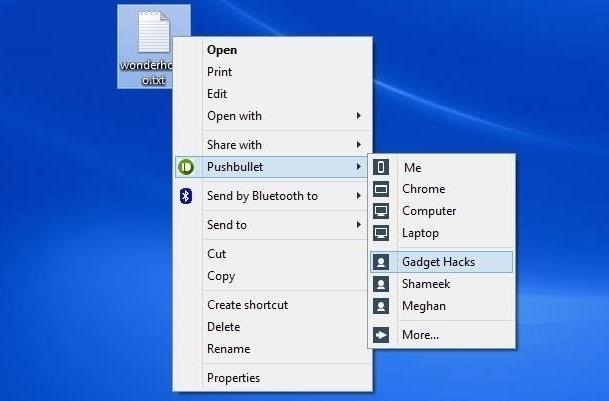 If you own an Android device and a Windows computer, there is absolutely no reason you shouldn't have Pushbullet installed. With the Android app and a companion Chrome plugin, you can easily send files between all of your supported devices, and there's even a notification mirroring function so that you never miss an important update. A beta Windows version of the program has been around for a few months, but lately it's been gaining traction, and today's release has brought one of the nicest features yet for PC. A new context menu entry with an expandable menu allows for sending files directly from Explorer with ease. Just right-click a file, hover on the Pushbullet entry, and click the device you want to send this file to. It's really that easy. To get the new beta version of Pushbullet installed on your PC, click this link to grab the .exe. Aside from logging in with your Google credentials, there's not much setup. Pushbullet will run on startup and a new icon will show up in your system tray. Install the Chrome extension here, get the Android app at this link, and your devices will be interconnected like never before. After getting everything set, enable custom notifications using IFTTT and dismissing notifications from your phone or tablet on your computer.